Just as there is often a story behind a handcrafted piece there is a story behind Woodburning with Style. That story begins with award-winning artist and pyrographer Simon Easton who has dubbed his creations "wood tattoos" because they remind him of getting a tattoo - both mark a surface and both can be used to commemorate an event or communicate a feeling. 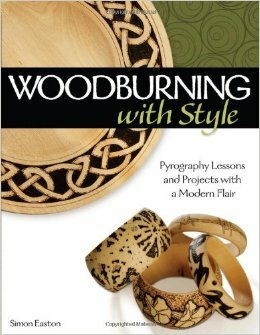 With his contemporary flair and use of pattern Easton takes you on a journey from the concepts and basics of woodburning to tips and techniques that encourage your creativity and the development of style.